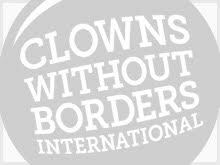 In December 2014, Clowns Without Borders USA went to Lebanon to perform 21 shows for 2850 people. In June 2014, Clowns Without Borders USA went to Lebanon to bring joy to the Syrian refugees. They performed 19 shows for 3800 people. In November 2014, Clowns Without Borders Spain went to Lebanon to perform 25 shows for Syrian, Iraqi and Palestinian refugees in Lebanese camps and in Tripoli, Beirut, Bekaa, Sidon. They met 13,000 people in total. 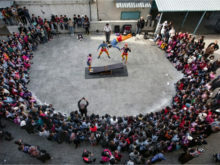 In 2013, Clowns Without Borders Spain went Lebanon to perform shows for Syrian refugees in several refugee camps camps. In 2011, Clowns Without Borders Spain went to Lebanon to perform 15 shows for 2372 people. The aim was to offer joy to and reduce the emotional vulnerability of the children in Palestinian and Iraqi refugee camps. In 2009, Clowns Without Borders South Africa returned to Lebanon and performed 2 shows for 500 people.